Horsemen have a way of reading a horse through his body language, and the eye is one of the most revealing aspects of an equine. 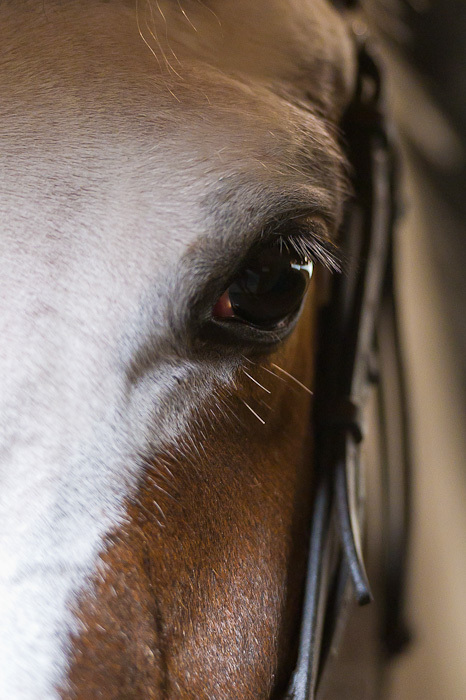 If a horse shows the whites of his eyes, he’s generally upset, spooked or annoyed. If his eye is dark and tranquil, he’s calm, relaxed and trusting. Today I had a jumping lesson, and afterward we stood in the ring cooling down. While I discussed our progress with trainer Amanda Penick, Teddy stretched his neck down, took some deep breaths and stood peacefully. While Amanda patted his neck, I could feel him relax under me, enjoying the moment and the attention. I’d even like to think he understood our discussion, about how proud we both were of him for cantering his first fences, negotiating a tricky gymnastic line and jumping whatever I asked of him so confidently. No, horses don’t speak, but they certainly let us know what they are thinking and feeling if we just take the time to watch and listen. This is a terrific photo Tricia! You really can sense calmness. Beautiful! Thanks, David! He doesn’t always look like this…but when he does I certainly appreciate it. I think as he matures, though, this will be his nature.